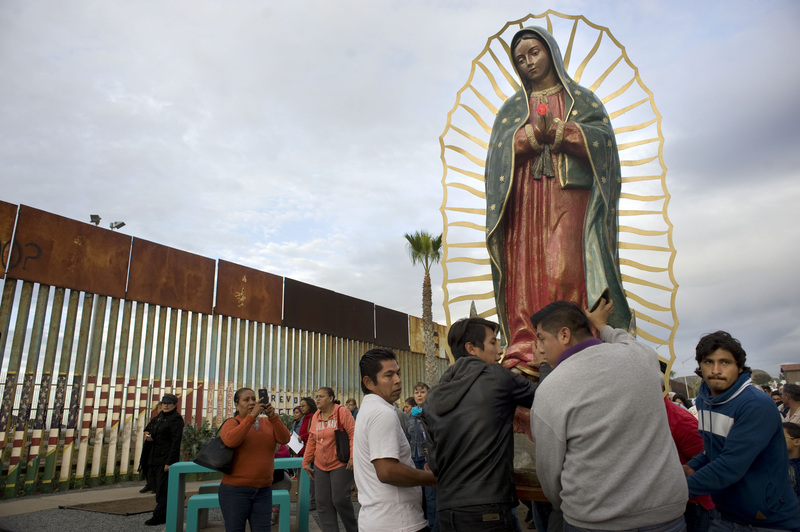 Archbishop of Tijuana: "The last thing we need is another wall." The following is the keynote address delivered on November 29 by Archbishop Francisco Moreno Barrón of Tijuana, Mexico, on the occasion of the 2016 Catholic Immigrant Integration Initiative Conference hosted by the Center for Migration Studies, Catholic Charities and the University of San Diego, in California. The text has been translated by Cecilia González-Andrieu, associate professor of Theology at Loyola Marymount University. This address about immigration is above all shared with you from my point of view as shepherd. Immigration is both an ancient and contemporary reality; human beings have always sought better conditions for their lives. At this border of Tijuana-San Diego, which is the most crossed border in the world, immigration has been, is and will be a great challenge for both the U.S. and Mexican societies, for their authorities and institutions, among these the family and the church. Every day a large number of Mexicans arrive in Tijuana trying to escape violence, poverty or a lack of work in their home communities. The majority of them have as their goal to enter the United States. But we also receive immigrants from over 20 countries. Because of this, the Archdiocese of Tijuana, which comprises the cities of Tijuana, Tecate and Rosarito, is growing at an accelerated rate. We now have three million residents. The face of our archdiocese is an immigrant face, made up of a mosaic of persons from diverse places, cultures, languages and traditions. According to recent studies, if we continue to grow at this pace, in 20 years Tijuana will be the second largest city in Mexico. This overwhelming reality can be seen as an opportunity and richness or as a problem to solve. It is best to see it as a challenge that must be faced. The church cannot solve all social problems, among these the presence of immigrants along the different borders. The church simply does not have the economic resources to do so; but we can contribute, be a sign and ferment in the midst of the community. As church, we possess the wealth of the Gospel, Christian values and many people of faith who share in solidarity and are committed to the common good. As church, we can also create consciousness and encourage open participation in society in all initiatives that are helpful to migrants, while also calling on the authorities to assume their proper responsibility. In Tijuana, we have been receiving many Haitians, who were previously admitted for asylum by the United States government but are no longer received. They have made a painful pilgrimage from Haiti or Brazil to arrive in Tijuana, with all of the risks of this journey, spending their savings and arriving in a city unprepared to receive them. I ask myself why the U.S. government does not look at the situation of each immigrant, each family, prior to their beginning this burdensome exodus, so that those who may be admitted for asylum could travel in safety and be received and integrated into work programs, with the great advantage that this would give to all involved. Since May 26, 2016, thousands of immigrants have tried to enter the United States through the Tijuana border crossing. What at first appeared as a temporary emergency has now been going on for six months, during which time over 10,000 Haitians have arrived in Tijuana. The five migrant shelters in Tijuana are insufficient to meet this heightened demand with all of the social complications this entails. We are now responding to a prolonged emergency, but the demand of forced migrations will continue. This is why we must organize ourselves so we may answer this challenge more effectively, inspired not only by humanitarian concerns but by the values of the Gospel. We find ourselves facing an extreme challenge; if we don’t act effectively at this moment of crisis on the border, it could spill over into even more serious problems. The church and our Archdiocese of Tijuana are committed to accompanying and to providing comprehensive assistance to the immigrant community. In order to do this, we are searching for alternatives: opening up a new migrant shelter, as well as opening up our parishes to welcome immigrants, collecting and delivering daily necessities and food to the existing shelters, all the while offering the immigrants the necessary spiritual support to strengthen them in their fragile condition. The possibility that some or many of these immigrants may remain in Mexico places many exigencies on us all, especially on the federal government that must assume their responsibility and provide some effective solutions. The church will not cease in our collaboration in this noble cause. For both countries, the integration of immigrants into work, social relations, education and religious practices represents a challenge, so they may be seen not as permanent burdens but as people who contribute through their identity and uniqueness to the integral development of the society that has welcomed them. I respect the decision of the people of the United States on the election of their new government. The issue that concerns us here are the immigration policies that the new president will assume, in particular, his oft-stated objective of mass deportations of Mexicans. The president-elect made immigrants a central focus of his campaign, insisting that he will build a wall along the Mexican border and deport millions of undocumented persons. He has asked the bishops of the United States to welcome each immigrant and to create bridges. He has asked them to find ways in which each diocese may “better respond to the growing presence, gifts and potential of the Hispanic community.” This would give tangible support to Latino immigrants, legal or not. There is no doubt that the immigration policy of the president-elect must be seriously questioned in light of the values of the Gospel. In the United States, in Mexico and in many other countries, there is still a long road ahead to the goal that immigrants will be treated with dignity. It is one thing to make campaign promises, it is quite another to actualize these in the act of governing. This is because these are decisions requiring consensus among various branches of government, and the interest and participation of the citizenry must also be taken into account. But what is abundantly clear is that having already two, the last thing we need is another wall. The international community summarily rejects these drastic and radical measures aimed at immigrants. The United States has on its agenda extremely complex issues to attend to in a variety of regions of the world; it seems illogical to focus on deporting Latino immigrants who have contributed greatly to the building up of the country they now call home. But we must not see each other as enemies. We will always be living side by side...What is happening now could be the beginning of a new and more mature relationship. On the other hand, Mexico must put to good use its diplomacy and cultivate bilateral trade relations with other countries, analyzing the situation with a Mexican focus and being prescient about the different possible outcomes. Mexico must face this great challenge through deploying its considerable potential as a people. It is also urgent that we integrate the efforts of the Catholic Church on behalf of immigrants around the world, especially in the United States and Mexico, because divided there is very little Catholics can do. However, when united we can achieve great things. We need to meet each other, dialogue and together put forward some initiatives. A natural and proper space for us to express our solidarity and to give attention to immigrants must be our parishes. Yet, it is also crucial that we live this moment as an expression of authentic ecumenism on the issue of immigration. This demands of us that we value the dignity of each human person because they come from the very hand of God. We must renew ourselves inside each denomination, which means we must live the values of the Gospel in relation to immigrants. Only then can we interrelate and join forces with other religions in everything that is for the good of humankind and concretely for the good of immigrant persons. We must never take advantage of this need for openness and dialogue to proselytize and never condition our help on someone changing their religion. As people of faith, we recognize in our immigrant brothers and sisters their full dignity as persons and see the suffering face of Christ asking us to meet him and answer with expressions of love and not threats, to recognize in them a blessing that makes God present among us. Perhaps the issue of immigration on this particular border and in the world will not have a quick solution. This is because there are many closed minds and hearts among those who can make decisions about immigration policies. But we cannot end our pilgrimage on earth without doing our part to build up a new and better human family by extending our help unconditionally to our immigrant brothers and sisters. The Most Rev. Francisco Moreno Barrón is archbishop of Tijuana, Mexico. This text has been translated by Cecilia González-Andrieu, associate professor of theology at Loyola Marymount University.